Movie theaters have come a long way. For instance, if I tried to play the pipe organ during Star Wars next week, I'd be arrested. And while the movie theater's place in a post-Netflix world is increasingly uncertain, Christmas remains the day we all flock there -- in part because their darkness makes it easier to avoid eye contact with family members, in part because sharing a bowl of popcorn is a nice thing. Just in time for that storied ritual, Regal Cinemas has given us something of a holiday miracle: Cheetos popcorn. Starting December 15, Regal Cinemas all across the country will be selling the miraculous combination of airy snackery, cheesy puffery, and corporate synergy. 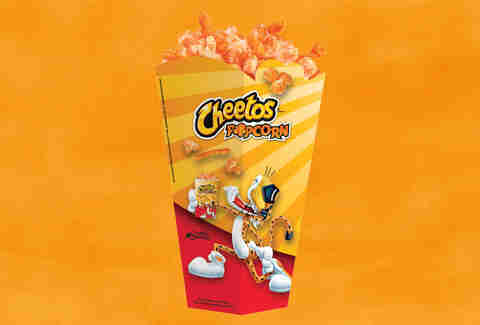 The product itself will be a mix of Cheetos-flavored popcorn and actual Crunchy Cheetos, which sounds way more filling than regular popcorn. Sports fans may recognize the product, as it's been featured in ballparks for a while now, but this is the first time you'll be able to get your cheese-coated hands on it while watching the latest Fifty Shades of Grey. It's been spotted in a few multiplexes already, so one near you may already have it. Anyway, if sharing a bag of cheesy popcorn with a loved one isn't what the holidays are about, then why celebrate at all? 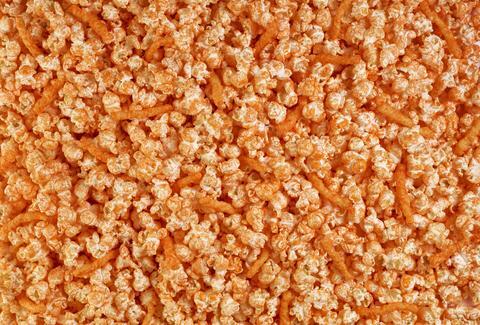 James Chrisman is a News Writer at Thrillist who too would like to live among the popcorn. Send news tips to news@thrillist.com and follow him on Twitter @james_chrisman2.